Regardless of how the court case concerning Juventus’ president Andrea Agnelli will end up, there could be a sudden change in the organizational structure of the Black-and-White of Turin. The family disagreements between John Elkann and Andrea Agnelli could lead to a historical change by the end of the season. According to Il Fatto Quotidiano, in addition to the judgment that Andrea Agnelli has to wait and that will be released by the sports judges after the inhibition of the federal prosecutor Giuseppe Pecoraro, Juventus’ president will face the judgment of John Elkann as well, the unloved cousin, that is the only heir of Gianni Agnelli. John wants the total control of the club like during the Calciopoli period when the club ended up with two seasons in the 7th place of the standings. Moreover, Elkann’s idea is to replace Andrea Agnelli with Juventus’ legend Alessandro Del Piero. The strategy seems to be clear. With a punitive judgment, the young Agnelli will have to leave Juventus due to the code of honor of a family that cannot bear (and support) a condemned manager, even if only for a day. We could say that John expects that the misfortune will strike Andrea. With Ferrari assigned to Sergio Marchionne for a sumptuous annuity and the American Fiat called Fca, Elkann needs a precious, shiny, and popular object to improve his image. 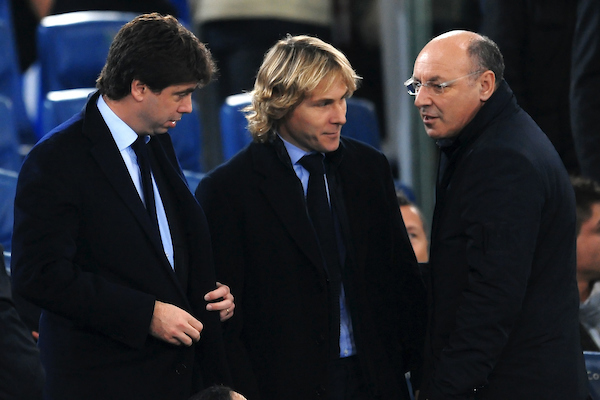 John has in mind to remotely manage Juventus while Marotta will look after the budgets and transfer market negotiations. In light of that, Del Piero for president is more of a suggestion.